Source of the “Green Swamp Mojo"
I make a wide range of stringed instruments, do special order builds, and vintage repairs. Contact me on my website for more info. 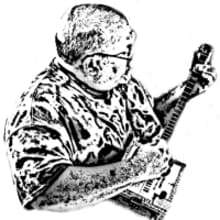 I am a self-taught wood carver and luthier that follows “Spiritual Inspiration” in my design and craftsmanship of his Musical Instruments and Folk Art. Every item that comes off my workbench is unique in it’s own way. Every design is a re-invention of the past. Each has a story to tell, a song to sing. "As the Ancient Artisans of old, I pay my way with my craft. The Secret behind the "Green Swamp Mojo" is found in the recovered Florida Bald Cypress that I use in my instruments. It is some of the finest tonewood that I've ever come across. This is Old Growth Bald Cypress that was recovered as deadfall from the Suwanee River basin and has been naturally seasoning in the Florida sun since the 1950's. This Old World Florida Bald Cypress has all the characteristics of fine tonewood. Straight, tight grain, very slow growth, light weight, yet very durable. I would match my wood against the finest Port Orford cedar (which is Lawson's Cypress), Alaskan Yellow Cedar (Canadian cypress), or the famous Mediterranean Cypress found in high quality Spanish Guitars. I just can't honestly call it cedar, because the Florida Cedar and the Florida Bald Cypress are totally different trees. There are very few Luthiers around that even have access to wood of this quality, let alone offer it as a Primary Tone wood. Shipping & Handling via U.S.P.S. Priority Mail, with Postal Insurance, Tracking, and Signature Confirmation. For both your protection and mine, I require Signature confirmation of delivery on everything I ship. Reputation is everything. I'm in the business of cultivating long term clients, not quick sales. If you ever have an issue with my workmanship, I will stand behind my instruments and work to make it right.